Let’s talk about this dress!! I don’t even know where to begin with this one. The style, the cut, the vision?? Made by one of my beautiful designer friends, Natasha Sakhuja, I had the pleasure of wearing this stunner-of-a-dress to one of Toronto’s International Film Festival (TIFF) events. She is such a superstar when it comes to Canadian fashion, and a sweet soul to work with. Her sense of fashion is nothing short of brilliant, and she brings an edge to her designs. Her work speaks for itself as you can see in the dress I’m wearing….seriously stunning, I know. When I saw this dress, I immediately knew it was for me! It brings out a slight bit of my Indian culture and was something I hadn’t worn before. The second I saw it, the fashionista in me started styling the dress in my head. From the accessories, to the hair, right down to the polish colour on my toes. I’m a bit of a nazi when it comes to styling an outfit. I mean, you can have the perfect outfit, but if you F up the styling, you’ve gone and ruined the outfit. #justsayin. Anyways, fabulous dress, fabulous designer. I would never take this dress off, if it were up to me! Previous Post THE PERFECT BUTTER CHICKEN RECIPE. Next Post Italian Deliciousness: Via Vai. Loved you in this dress! Made me want to get one too 🙂 Gorgeous darling, gorgeous! I love this modern saari style !! Thank you for sharing it. Indian lehenga saari is the best outfits for women and buy online sarees in india at best price !!!! 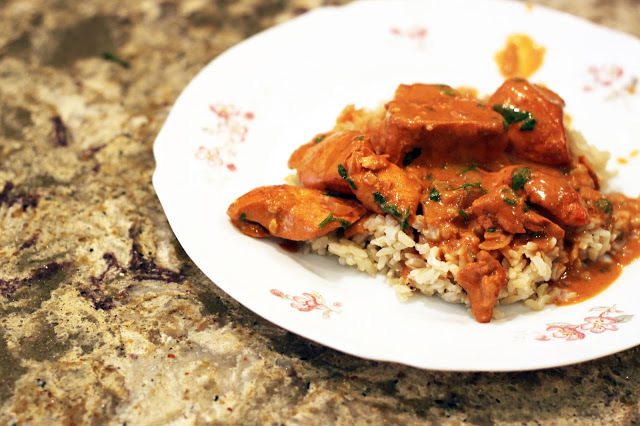 THE PERFECT BUTTER CHICKEN RECIPE.